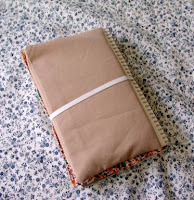 I made several sketchbook covers during my orange curtain project. But none of them really worked out - I think they were just too bulky. It made me not want to carry the sketchbook at all. So here's my new sketchbook wallet (sorry, no curtains involved). It's a little slimmer, but can hold essentially the same stuff. I like this a lot and have been doing better about using my sketchbook for the last several weeks. 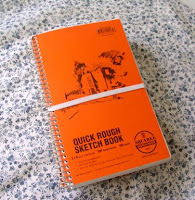 It snaps around the sketchbook with a simple piece of elastic and has a piece of chipboard on one side to make it lay nicely against the book. I've got my pockets stuffed with laminated pictures of some of my favorite artworks, some scrap paper and vellum, paper clips and glue dots, pen, pencil, charcoal and eraser. Sketchbooks are one of the easiest and most productive ways for an artist to keep fresh, so I really want to get back into one. I customized some of Keri Smith's creativity prompts to keep me going. The first one I used was, "draw your favorite tree" - so the little sketch you see is the locust tree by our back porch.